The landscapes we went accross on the first day were not that impressive but we had to be in Cordoba for the night to meet Jane, a young Quebecker full of energy who joined us. The most we went to the North the most impressive the landscapes were with huge deserts surrunded by colourful mountains. 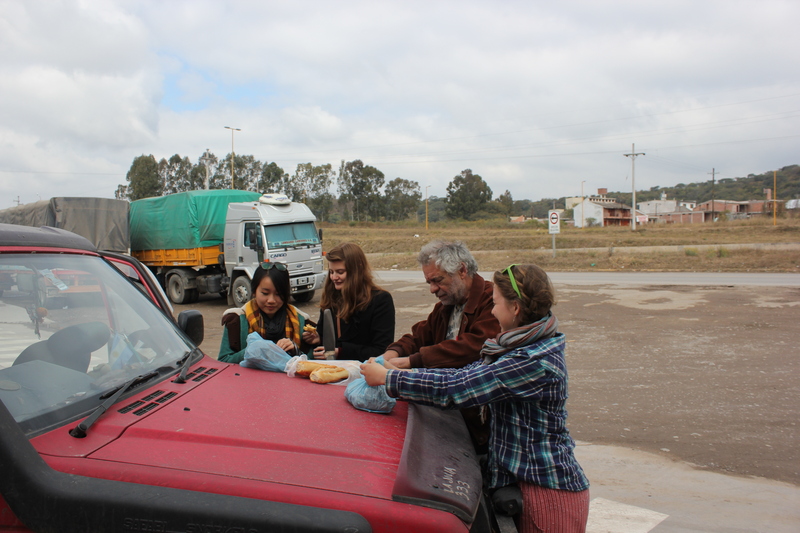 The atmosphere in the car is friendly : we sing, we laugh, we eat! Ivan needs an assistant to prepare his maté, a tea that most Argentinians drink with a kind of metal straw in a pot that they take with them absolutely everywhere. One of our first stop was San Marcos Sierras where Jane and I volonteered to sleep in the tent. This small village is located in a basin right in the middle of mountains. Therefore it gets really cold, especially at this time of the year. I was psychologically prepared to spend an horrible night. I remembered painfully the nights we spent in the car in Flagstaff last February. I put on several layers of clothes and in fact it was not as cold as I thought it would be. I fall asleep pretty quickly. The night would have been good-ish if a dog had not decided to jump on me right in the middle of the night barking at the tent ! My head was touching the canvas of the tent so I really felt his paws on my face ! I really freaked out but fortunately I could hear the beast walking away but at that moment I heard it chewing something. I immediately thought about my shoes that I had left at the entrence of the tent ! I put my head out of the tent : there was no dog...and no shoes ! Good I still had a pair of flip flops at the bottom of my bag. A couple of days later we arrived in Cafayate where we spent a couple of nights. We explored the nice little market next to the main square and then we went to eat some ice creams. Yes, in Argentina there's no time and no season to eat ice cream and do barbecues, it's all year round ! At the youth hostel we met Manuel who was enjoying a few days break away from work. He joined us for the rest of the trip. 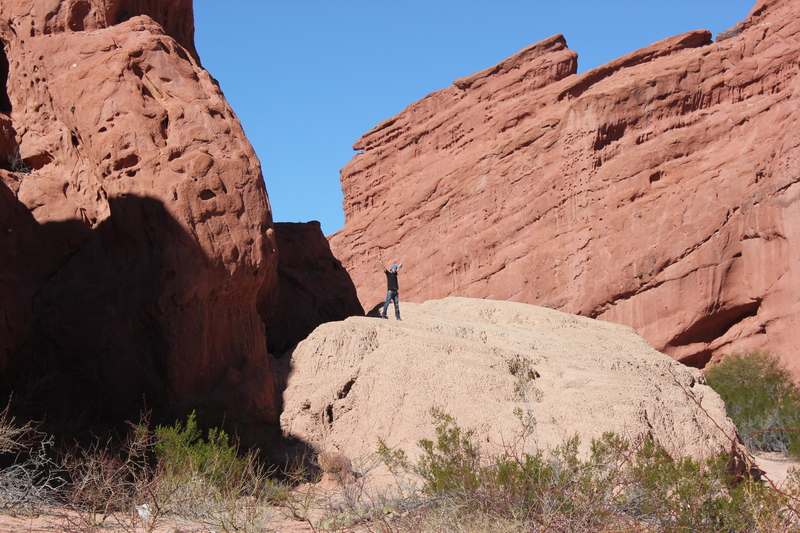 We explored a breathtaking valley with him, La Cobrada de las Conchas that offers incredible landscapes. The red rocks reminds me of the Monument Valley that I saw at the very begining of the journey. 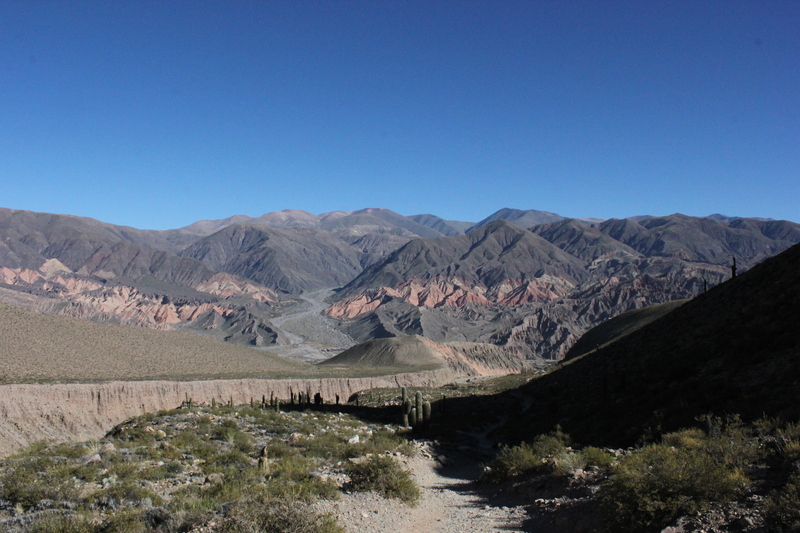 Then finally, 3000 kilometres later we arrived in Salta for the weekend. Unfortunately the sky was grey and it was cold. We stayed there only for a couple of nights to have a rest. 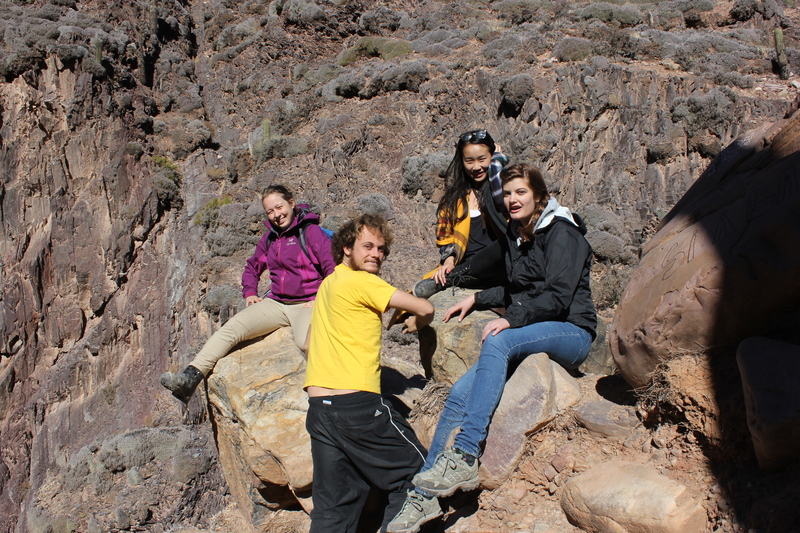 After the weekend it was time to say goodbye to Laura and Cecile who had planned to stay longer in Salta, and Manuel who had to back to work in Cordoba. But very quickly we were joined by two Americans Abbie and Cathy who had work a week in La Malfatta as well. Thus it's the five of us who headed North. The landscapes there are all very spectacular and it shares some similarities with Bolivia : people's color of skin, the lamas that walk along the road and the coca leave chewed by many people. 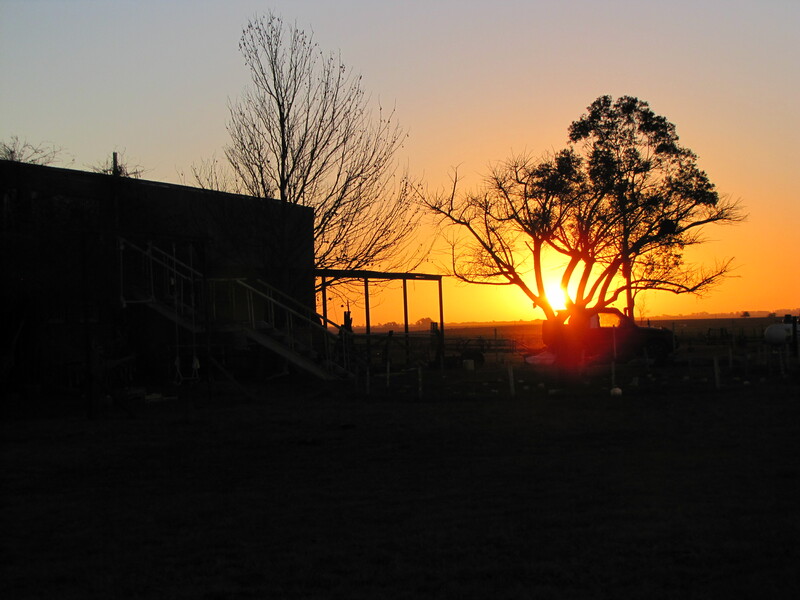 The North is probably the most traditional part of Argentina. The climate changes as well : it's very hot during the day but extremely cold at night. The change of temperature is impressive and it's not surprising that I caught a nasty cold. It didn't prevent us from continuing to visit from a little town called (cold!) Tilcara. 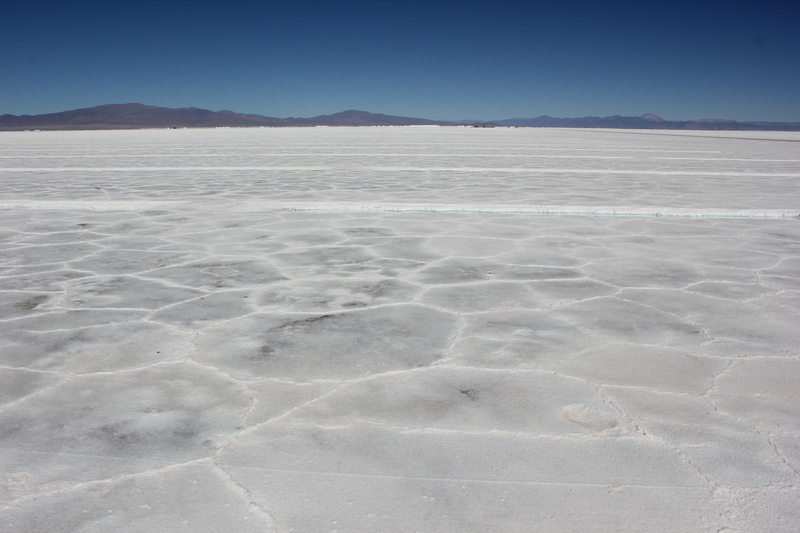 We explored Las Salinas Grandes, large desert of salt, not as impressive as the Salar d'Uyuni in Bolivia, but really nice anyway with its surrounding mountains. On the second day we woke up very early to go for a small hike in one of the mountains that surronds Tilcara. Once more the landscape is amazing with colourful mountains covered by cactus. We rushed a bit as the Cathy and Abbie had to go back to Salta in the day. We went back and we splited. As far as my cold is concerned it got worse. I had an horrible soar-throat, I coughed and I probably had some fever. I stayed in bed for the rest of the day. After this long rest I feel much better but I decided to leave as well. Ivan and Jane wanted to stay some more time in Tilcara but I couldnt stay for too long because I had to be in Santiago, in Chile at the end of July where I have a flight. 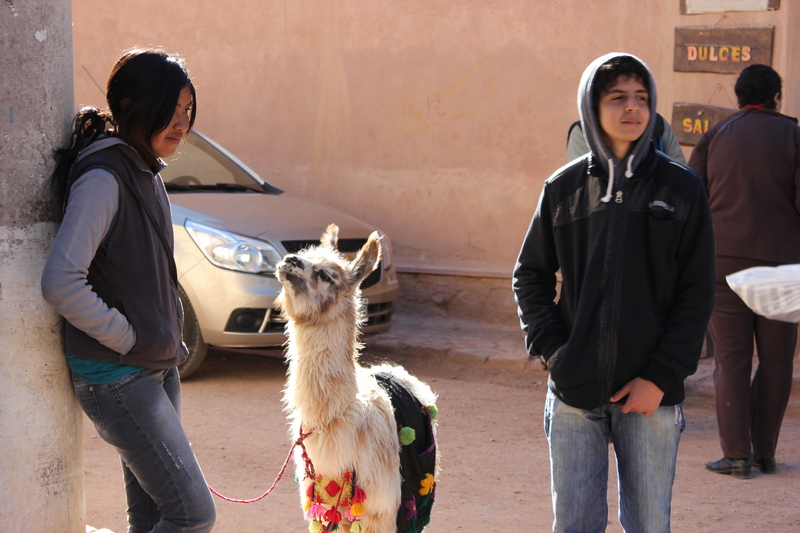 Sadly I have to let my two travelling companions to go back down to Salta …..